“Look honey, fresh garbanzo beans!” the lady with the wide-brimmed sun hat said to her husband. She’d never seen them before. Nor had the next ten people that walked by as I snapped photos. What did they think - garbanzo beans rain down from the sky? Ok, who am I kidding…. 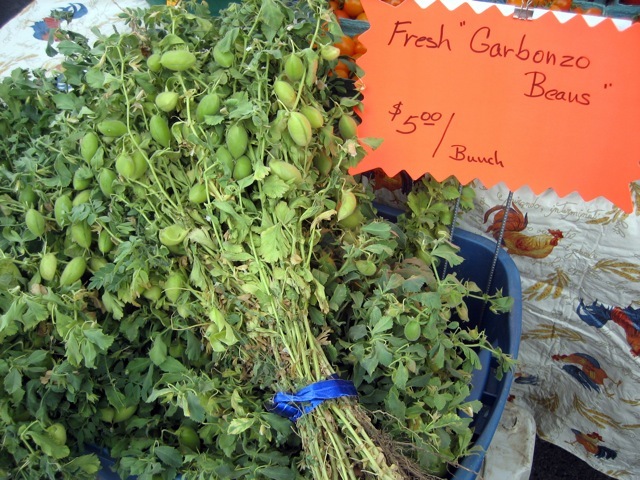 I totally had never seen fresh garbanzo beans before either and had the exact same reaction. I stared at their fuzzy pods, their thin stalks. Fresh garbanzo beans, nice to meet you. I made another lap around the Hillsdale Farmers' Market. Wanting to make hummus since I had my foodie friend’s homemade version, I was drawn back to the Sun Gold Farm booth. Hummus is brown. These beans are green. Can I make hummus with fresh garbanzo beans? I was already confused and I hadn’t taken them home yet. I emailed my foodie friend for help. A typical foodie, he poo poo-ed hummus as being unworthy of mentioning and went straight to garbanzo bean beer nuts or ‘how about a mezza plate?’  A whatza plate? Beer nuts were tempting, but I think we’d need dried beans. Maybe next time. The ingredients for hummus are simple. Garbanzo beans, garlic, olive oil, lemon juice and tahini. Feeling confident, I headed to the store for the remaining ingredients. At the store, I realized what I thought was tahini was actually tabouli. Tahini was a complete mystery. I have no problem stopping to ask for directions. I have a major problem asking for help in a store. I tried calling my husband to get him to google ‘tahini.’ No answer. I considered going home and coming back. No time. Rats, I should have forked out the extra cash for the I-Phone. Then I spotted a box of pre-made hummus mix ‘with tahini’ on the shelf. The mix was in powdered form. Ok, maybe it’s a spice. I stared hard at the spices section until the same guy passed me three times. I was beginning to give off the scent of desperation, a salesperson would notice any minute. A few years ago when trying to figure out what fennel was,  I circled the produce aisle, attempting to look like I knew what I was doing. I’d read that fennel smells a bit like black licorice, so I picked up what I thought was fennel and gave it a casual smell. The produce guy was by my side in seconds. Smelling, not being the typical way to select fennel, was a dead giveaway. Note to self #1 – don’t smell the fennel. Note to self #2 - research ingredients before going to the store. Now desperate, I picked up another hummus mix box. On the ingredient list next to ‘tahini’ were the words ‘sesame paste’ in parentheses. A paste! Like anchovy paste! Maybe I should be looking for a tube? I finally found it in a mayonnaise-sized jar. Who needs salespeople with powers of deduction like mine. To make hummus, follow the directions here: http://www.mydailydiner.com/2009/05/green-humus.html  It worked! And it tasted good, even though it was green! Q: So, what about the garbanzo beans at the salad bar or in a can? A: Those beans have been dried and canned. The beans turn brown when they dry. Q: And what’s the deal with the garbanzo bean vs. chickpea thing? A: Chickpea is the original name. They grow wild in Turkey and Syria and are thought to have first been domesticated there thousands of years ago. For more history on the chickpea, and its introduction to the U.S. click here: http://www.hort.purdue.edu/newcrop/AFCM/chickpea.html  The garbanzo name hails from the “family of Italian tight-rope walkers known as the "Flying Garbanzos", who were known to cultivate chick-peas for their long journeys throughout the Mediterranean.”  Or at least that’s one “scholars” opinion, according to wikipedia. Perhaps the word scholar may have been used a bit loosely.